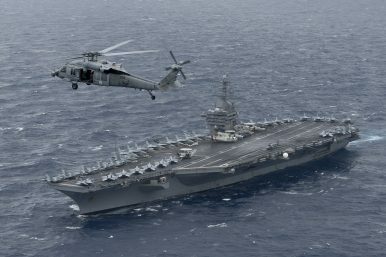 The nuclear-powered Nimitz-class aircraft carrier USS Theodore Roosevelt and the Theodore Roosevelt strike group entered the Western Pacific Ocean amid increasing tensions between the United States and North Korea on October 23, the U.S. Navy announced in a statement. The carrier strike group entered the U.S. Navy’s 7th Fleet area of operations on Monday. The 7th Fleet is the Navy’s biggest forward-deployed fleet, with its area of operations stretching from the International Date Line to the India-Pakistan border, and from the Kuril Islands in the north to the Antarctic in the south. In addition, the U.S. Navy announced that the Nimitz strike group consisting of the Arleigh Burke-class guided-missile destroyers USS Howard, USS Shoup, USS Pinckney, USS Kidd, and the Ticonderoga-class guided-missile cruiser USS Princeton returned to the 7th Fleet area of operations on October 25 following a deployment to the Persian Gulf. The USS Theodore Roosevelt is expected to make its way to the Persian Gulf to replace the USS Nimitz. The U.S. Navy has not announced any specific missions for the two carriers. The USS Ronald Reagan carrier strike group, operating out of Yokosuka Naval Base in Japan’s Kanagawa Prefecture and currently the U.S. Navy’s only forward-deployed carrier strike group in the Asia-Pacific region, has recently completed a major naval exercise in the waters off the Korean Peninsula. The USS Ronald Reagan is currently anchored off the port of Busan. Republic of Korea (ROK) Army General Jeong Kyeong-doo, chairman of the Joint Chiefs of Staff (JCS), and the commanding officer of U.S. Forces Korea General Vincent Brooks met aboard the carrier on October 24 to discuss ongoing tension on the Korean Peninsula, according to Yonhap news agency. “Amid an unprecedentedly grave security situation, the deployment of Ronald Reagan and its carrier strike group to the Korean Peninsula and their joint exercise with South Korea is part of the increased deployment of U.S. strategic assets here. It must have been a strong warning to North Korea,” Jeong was quoted by the JCS as saying aboard the carrier. In June, two U.S. Navy supercarriers — the USS Ronald Reagan and USS Carl Vinson — conducted joint naval exercises off the Korean peninsula in the Sea of Japan in response to North Korean ballistic missile tests. It was the first time that two U.S carriers were operating near the Korean Peninsula since the 1990s. A carrier strike group can consist of up to 12 warships, including one to two submarines and 75 aircraft. The U.S. Navy is conducting a three-carrier strike force exercise off the Korean Peninsula from November 11-14.